Earlier this month history was made when UK culture secretary Matt Hancock became the first UK Member of Parliament to launch his own app. 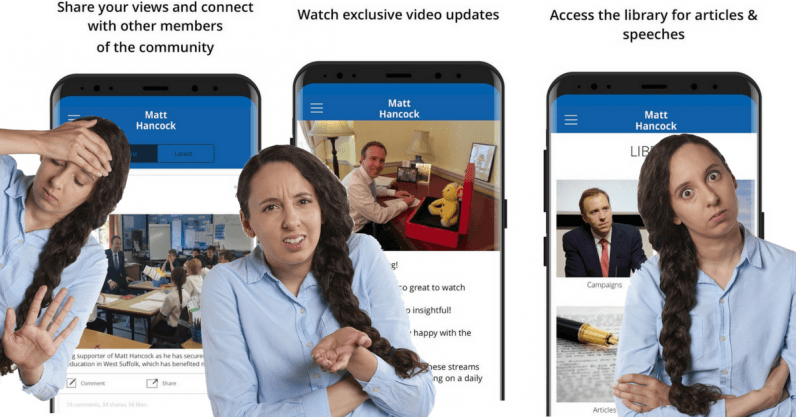 The aptly named Matt Hancock MP app had something of a mixed reception from a bemused media. While the general aim, to allow Matt to connect with his West Suffolk constituents, is promising, the hasty execution has left much to be desired, as the app is riddled with privacy issues, careless functional errors, and silly UX mistakes. While I very much encourage other politicians to launch their own apps, I don’t recommend imitating like-for-like the efforts of the UK’s now-infamous culture secretary. However, I do give my thanks to Matt Hancock MP for providing us with an example to be avoided for the future. So now the media flurry has died down, what lessons can we learn from Matt Hancock MP? Whilst most have focused on privacy flaws and data grabbing, there’s plenty to be improved upon from a UX perspective. Here’s a rundown of the app’s cringeworthy UX mistakes — and what to avoid next time. Matt’s app had a worthy goal. His constituents in West Suffolk, the fairly rural region of the UK which he represents, can catch up with his activities, connect together, and proffer their opinions. In its infancy, this spectacularly backfired as the app was hijacked by snarky journalists and ‘London types.’ But even if we forget about the trolls, it’s hard to see how Matt’s app fulfills these aims. Matt claims that the app is about discussion: but there’s little evidence of this on the app. It’s essentially a big repository of content which relegates discussion to the bottom. If a user comes to an app expecting discussion, then discussion is what they should get. Claiming to provide something that you don’t is a surefire way to send your users running for the hills. Matt has fallen in to the classic corporate-app pitfall of claiming to provide a useful service, but slipping in to self-promotion — so his app might’ve been doomed from the start. For any product, a good first impression is vital to keeping your user engaged and happy — especially since one in four mobile apps are abandoned after the initial use. And the Matt Hancock app provides important lesson in how not to make a first impression. When you open Matt’s app, you are quickly shocked into submission by a full volume talking Matt Hancock head welcoming you to his app. Not so great if you’re in the office or public transport. And the novelty soon wears off when you are greeted by multiple ugly screens each showing the same guidelines worded in a slightly different way. Blasting the user with a full volume video when he/she opens an app for the first time is never a good idea. Some might claim that this repetition is merely building the anticipation to get to the meat of the the first ever app made by an MP. But if this were any other app, users would have said goodbye after the first screen. The UK Government isn’t known for being particularly cutting edge when it comes to digital and, as TNW points out, Matt only discovered Uber in 2014. But Matt Hancock MP seems to have bypassed every single development from the past ten years when it comes to visual design. The color scheme is grim. The opening guidelines appear as white text on a royal blue background, which is hideous to read. The visual design is literally nil, whoever wrote this put it in a text editor, and just as we’ve got used to the royal blue and have made it to the sign-up page, the colors totally change to a dark navy. This is too easy not to rectify. Your colors should be easy to read and appropriate. There are plenty of other ways to input text besides using a text editor. Make sure you test out your visual design on potential users and double check beforehand whether it fits with your message. Now, I’m not sure how digitally savvy the residents of West Suffolk are. But regardless of digital literacy, this app is pretty impossible to navigate. Signposting is poor and distracting. You have to jab at the screen multiple times to find your way around and click several times to get off main screens. The key lesson here is to keep your navigation simple, particularly when your app is aimed at the general public. Usability depends on allowing users to easily complete tasks. If a button is placed in the ‘wrong place,’ users will get frustrated. If the flow of an application is unnatural, users will get frustrated. And frustration is exactly what causes a user to close down an app and never come back. The app seems to have been rushed to market with little to no thought given to the UX. Yes, it has had its moment in the sun, as users download the app in order to see what all the fuss is about. But will it actually achieve its goal of helping constituents connect? Unlikely, and that’s a shame because the concept of a hyper local network is, on the face of it, a good idea. So thank you, Matt Hancock MP, for providing us with a salutary lesson in user experience. Of course, a poor UX is part of the charm of this rough-and-ready app. But aspiring app developers would do well to treat it as a ‘what-not-to-do’ for the future.